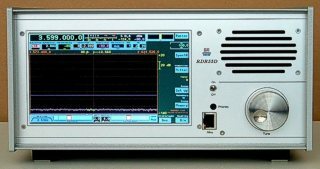 The measurement and communications receiver RDR55 can be flexible configured for many purposes in the range of 0 Hz up to VHF. Its big display and the up-to-date touch screen control allow for fast operation of the device. The device consists of a basic unit (Mainframe RMF22) with bus board and pluggable modules. 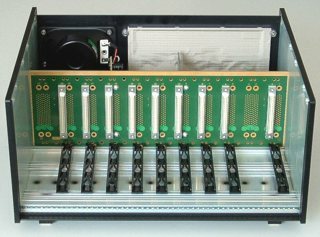 The modules can be back-mounted in 9 slots. The front of the RDR55 is pre-configured (single front panel). The 7” (178 mm) wide-screen display contains a touch panel for easy control of the device. The smooth and non-locking optical encoder allows for a quick change of the settings. All back-mounted modules of the RMF system can be installed. Because of the greater height of the casing opposite to the RDR54, the modules possess higher front panels. The RMF system has a proprietary operating system (real-time multi-task / multi processor) at its disposal, for cross-linking the modules across various data interfaces. 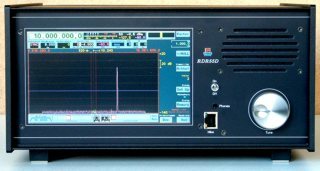 It implements the functionality of a digital receiver with very fast graphic representation (spectrum, operation) into the RDR55. With the corresponding modules, a transceiver expansion is possible. The RDR55 is currently available as RDR55E1. Delivery takes, depending on equipment, two to several weeks. The other specifications for the RDR55 are the result of the used modules and the software. Please consult the current documentation. If the existing RDR54 possesses an older audio module (prior to version F), a current module is needed additionally. The rotary encoder of the RDR54 can always be reused, if a magnetic or optical version. Mechanical locking versions (till RDR54 version C) cant be reused and a new rotary encoder is needed.